I’m so happy to be celebrating with my dear friend Alex Berger at his 30th birthday performance at Rockwood Music Hall (Stage 2). 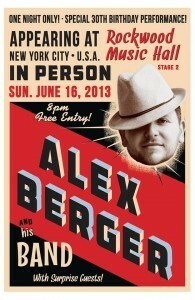 Alex will be joined by a phenomenal band and I’ll be one of the surprise guests!! Best of all the show is FREE!!!! and celebrating will continue post show at Stage 3! !